The shooting of anti-Sterlite protestors is firmly in focus in the constituency. While the DMK hopes that it will swing fortunes its way, the BJP hopes it will have only a limited impact. Thoothukudi: Thoothukudi is at once fascinatingly historic and effortlessly contemporary. The port town of Southern Tamil Nadu has found a mention in Sangam literature and Marco Polo diaries. From pearl fishing to deceptively named night clubs, Thoothukudi has many identities to flaunt. Yet over the last year, the Pearl City has been in the news for all the wrong reasons. It goes to polls less than a year after 14 protestors were shot dead by police for demanding that the Sterlite Copper plant be closed, Thoothukudi is facing an uneasy predicament. 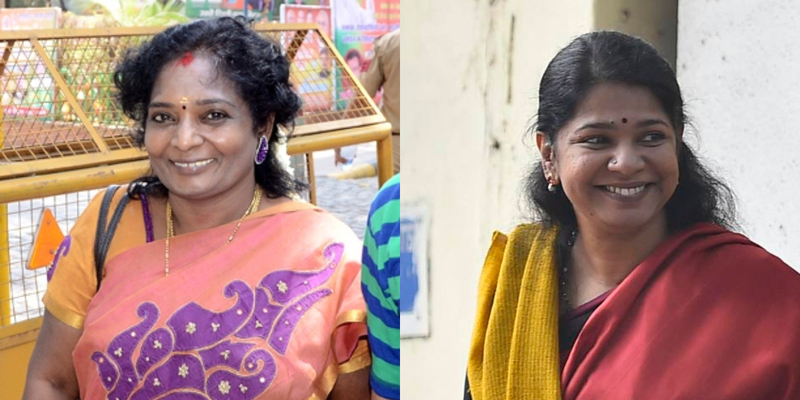 The choice before the electorate is between two powerful scions – Kanimozhi of the DMK and Thamizhisai Soundarajan of the BJP, whose father Kumari Ananthan is a Congress veteran. Less than two hundred kilometres away in Kanyakumari, Thamizhisai’s uncle H. Vasanthakumar will be taking on the BJP leader and Central minister Pon Radhakrishnan on a Congress ticket. M. Bhuvaneshwaran from T.T.V. Dinakaran’s Amma Makkal Munnetra Kazhagam (AMMK) is also in the fray, as is actor Kamalhaasan’s Makkal Neethi Maiyam (MNM) candidate T.P.S. Pon Kumaran. It is not a coincidence that almost all candidates are from the Nadar community that dominates the constituency. Thoothukudi also has a sizable number of Christians and Muslims, which the DMK hope will help their cause. For Thamizhisai, Thoothukudi could be a Hobson’s choice. Observers say the AIADMK was reluctant to contest, given the backfire after the protestors were killed. The constituency, formed after the delimitation in 2008, has been held by the DMK once and the AIADMK once. The BJP could be making a huge gamble by fielding its state president in the constituency. Unlike the rest of India, Tamil Nadu had refused to be swayed by the Modi wave in 2014. Things have not changed much since. From the Thoothukudi shooting to the Gaja cyclone and NEET, the general mood of the state is seemingly against the current BJP regime in the Centre and is likely to reflect in the polls. But the state BJP president is braving all the odds. Campaigning on the plank of development and anti-corruption, Thamizhisai says her election to the Lok Sabha will transform Thoothukudi into a ‘developed constituency’. “I am contesting here because I belong to this constituency and I hope to serve it,” Thamizhisai recently told media persons in Thoothukudi. Pitted against her is the formidable Kanimozhi who is facing the electorate for the first time since her entry into politics in 2007. As two-time Rajya Sabha MP, Kanimozhi has seen the highs and lows of politics. From receiving flak for the 2G case to being chosen as the best woman Parliamentarian, Kanimozhi has come a long way. “I have never shied away from meeting the people, but this is a heart-warming experience – to meet them for yourself. The response is overwhelming” Kanimozhi told The Wire. She says the people of Thoothukudi feel let down by the Central and state governments. From unemployment to the Sterlite issue and GST, Kanimozhi’s campaign touches various issues that strike a chord with the locals. 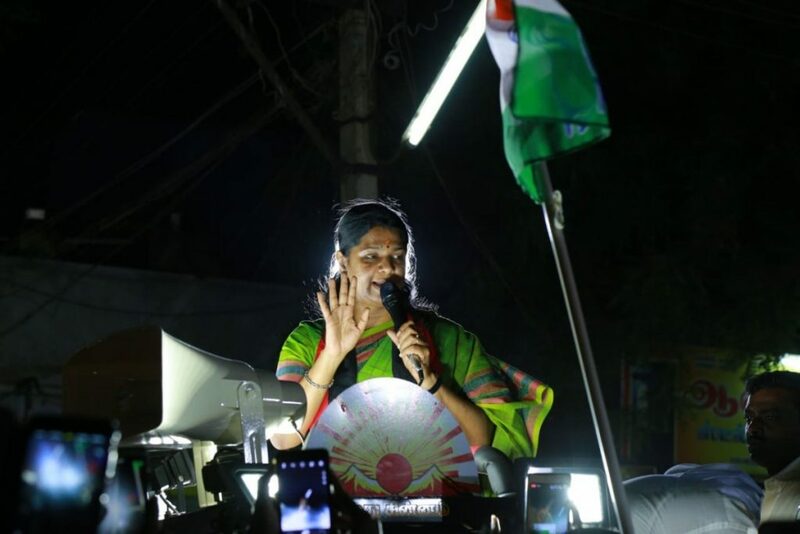 Observers also point out that Kanimozhi has been nurturing the constituency well before the elections and has earned a name for herself among the general public of Thoothukudi. The anger over the shooting of anti-Sterlite protestors is still palpable on the streets of Thoothukudi town. “I feel like I am being beated with slippers” says P. Prabhu, a protestor and a resident of Thoothukudi, on the candidature of Thamizhisai. “How can the BJP even seek votes after all this?” he asks. Thamizhisai has stoically responded to queries on Thoothukudi, maintaining that the issue is in court and that the killings were ‘unfortunate’. In an interview to a Tamil channel, she lost her cool and called off the interview when asked to respond on Sterlite and NEET. Sources say she is seized of the impact of the Sterlite issue on the BJP’s vote, but hopes ‘it won’t go beyond the town of Thoothukudi’. On the other hand, Kanimozhi has been raising the Sterlite issue in almost all her campaign meetings. On April 19 in Thoothukudi, DMK president M.K. Stalin demanded justice for those killed by the police. The DMK chief also recalled student Lois Sophia’s confrontation with Thamizhisai and insisted that the ‘fascist BJP regime’ needs to go. While agreeing that Sterlite is a very sensitive and major issue, Arivazhagan Rayan, an activist who has worked in Thoothukudi, says there are other issues that the elected representative also needs to focus on. “The fishermen have their own set of problems, like not being able to procure enough kerosene. Agricultural labourers are facing a huge crisis,” he said. Rayan also says the Centre’s policies such as GST and demonetisation had a negative impact in pockets like Kovilpatti, which is known for cottage industries like peanut bites. Finally, it all boils down to the contest between two powerful women of Tamil Nadu’s politics. “She is the leader of the BJP, and has braved a lot of personal insults which shouldn’t have happened in the first place. But let’s also remember, when a young college student raised a slogan, Thamizhisai filed cases against her, which was completely unwarranted. The people of Thoothukudi have been seeing all this” Kanimozhi says. 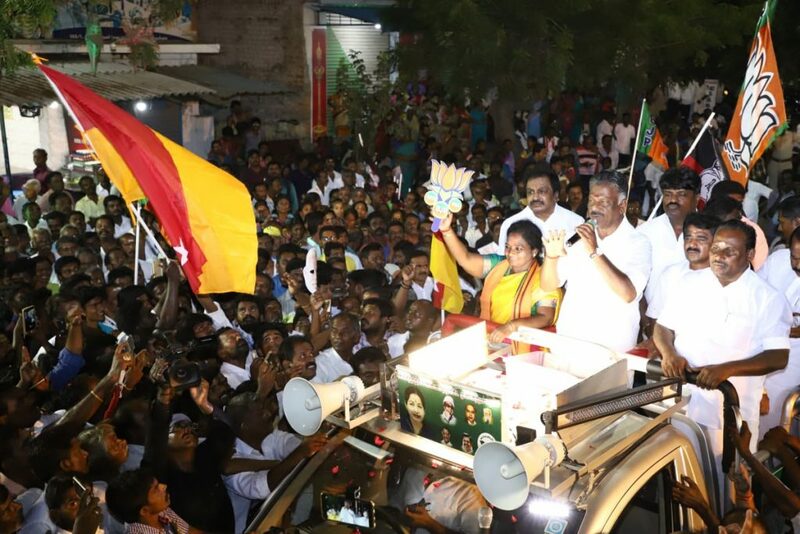 It is to Kanimozhi’s advantage that the party and alliance partners have been aggressively campaigning, unlike in the AIADMK-BJP camp, where the campaigning is ostensibly lacklustre. Kanimozhi herself has attended at least 60 gram sabha meetings before elections were announced, preparing a solid ground for her candidature. Thamizhisai, on the other hand, hopes the alliance arithmetic might just work in her favour. 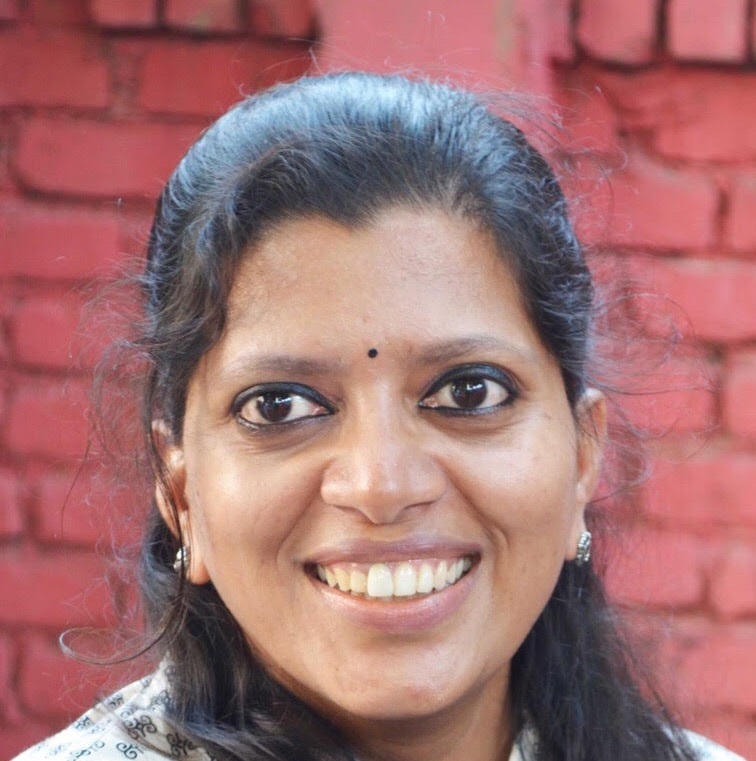 Kavitha Muralidharan is an independent journalist.